How to Tell if Your Touchless Sealant or Ceramic Coating is Working | Gold Eagle Co.
Touchless sealants and ceramic coatings take slightly different paths to the same destination. Both compounds bond to exterior paint to form a water-repellent barrier. You’ll see water quickly bead up after treatment. At highway speeds, these beads glide right off your vehicle. Pollutants trapped in those water beads harmlessly fall to the ground. There are many chemical contaminants that can etch or otherwise damage your vehicle’s clearcoat. Fortunately, acid rain is not one of them. It is less of a concern in Australia than on other continents. On your vehicle, what kind of exterior paint. surfaces do you want, hydrophobic or hydrophilic? Both terms include the word root “hydro,” referring to water. Hydrophobic substances repel water, while hydrophilic ones attract water. When you hear hydrophobic, think beads of water. When you hear hydrophilic, think sheets of water. Therefore, you want to apply hydrophobic products to the exterior surfaces of your vehicle. Car waxes, touchless sealants and ceramic coatings exhibit impressive hydrophobic qualities. A touchless sealant delivers three key advantages: easy application, longevity and modest cost. After a fresh application of touchless sealant, pay close attention to how water beads up on the surface. As the speed of your vehicle increases, those water beads gather into rivulets that flow off your vehicle’s paint. On an untreated vehicle, sheets of water tend to cling to the surface. Beading is less pronounced as a touchless sealant or ceramic coating becomes less effective. Eventually, sheets of water will replace the tight, well-defined beads. When this happens, water remains on exterior surfaces longer than it once did. As a protectant’s hydrophobic capacity diminishes, water will increasingly cling to the surface. Decreased beading signals that it’s time for another application of your protectant of choice. To better visualize beading vs. sheeting, think about your windshield. Sheets of water hurt visibility while beading water preserves visibility. You can still see through glass with water beads because most of the surface is actually water-free. Before the first application, you’ll notice that sheets of water spread out across the paint finish. Immediately after applying 303 Touchless Sealant, water will form into tight beads. The product is easy to apply. Spray it on your exterior paint and rinse. It’s that simple! 303 Touchless Sealant also keeps dirt and grime off your wheels and tires. You can also safely use it on your windshield and other glass surfaces. A touchless sealant eliminates the hours required for hand waxing. It also eliminates the cost of a professionally applied ceramic coating. Get the water beading you want while you save time and money. In the sunlight, those rounded beads act as prisms that grab and reflect the sunlight. Your vehicle will positively sparkle! Once you witness the deep, glossy shine and the superior beading, you’ll wonder how you ever lived without 303 Touchless Sealant. Retain superior water beading with periodic treatments. 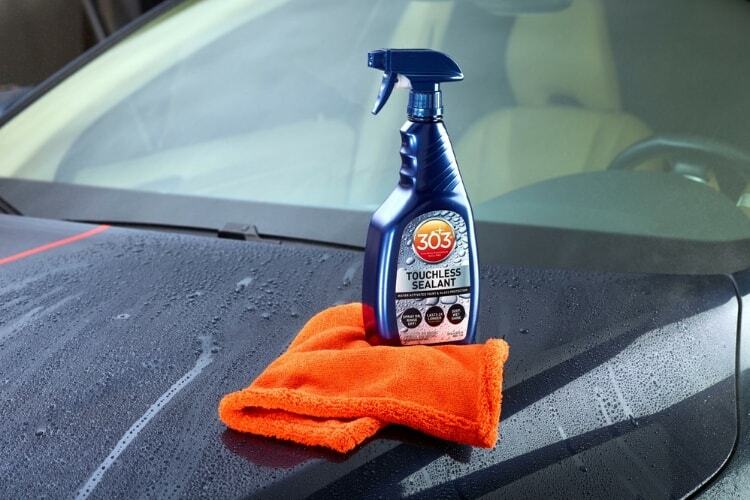 Consider 303’s entire line of high-quality cleaners, protectants and other car care products. They’ll give you the pleasure of driving in a vehicle with a dazzling exterior and an inviting interior. Protect your investment and enhance your pride of ownership!